Originally released to commemorate a 1996 tour between Guided by Voices and Superchunk. Unfortunately, the tour never formulated, however, thankfully this release did. GBV held tracks 4, 5, and 6 of the six song split. The track "Key Losers," was released the same year. 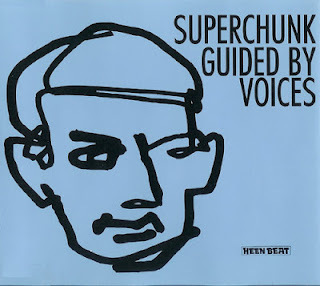 The Superchunk tracks can be heard on their wonderful two CD compilation, Cup of Sand. Delayed Reaction Brats- 4 Complete lo-fi crunch, similar to Alien Lanes fidelity, similar to Alien Lanes song length, similar to Alien Lanes chorus hooks. Alien Lanes, again. Great lead riff. He’s the Uncle- 4 Steve Albini recorded track intended for the UTBUTS LP. Short, steady, mid-tempo song with a great melody. Key Losers- Same version that appears on Tonics and Twisted and Chasers. Read review here.